Our group departs the USA on January 4th bound for Johannesburg and on to the majestic city of Cape Town. Here we will stay at the luxurious Cape Grace Hotel located in the heart of the V&A Waterfront. Rooms all have a view of the harbor and stunning Table Mountain. 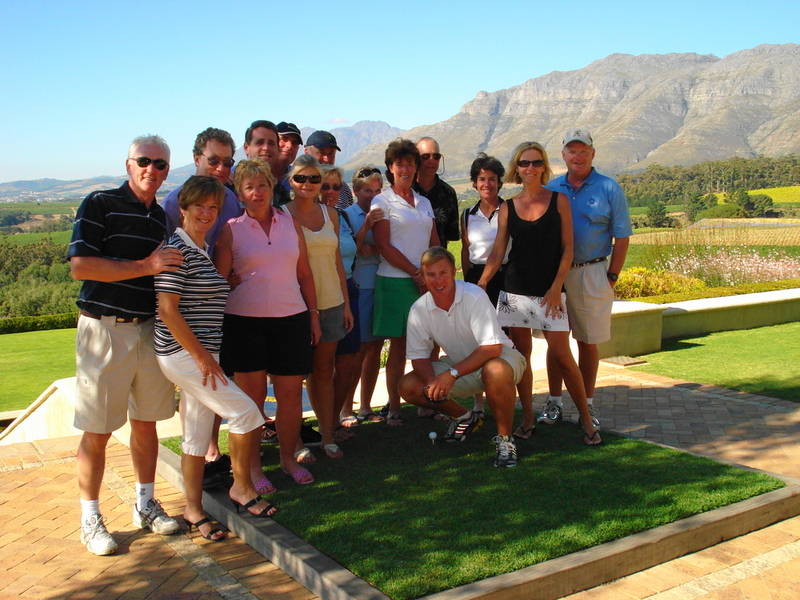 While in the Cape we will play three rounds of golf at: Arabella Golf Club, Steenberg Golf Club and Pearl Valley. Following golf each day, we will tour and taste at some of South Africa's top wineries: Fairview, Hamilton Russell, Ernie Els and Boekenhoutskloof are all on our list. We will also spend a glorious morning touring Table Mountain, where you will get a panoramic view of one of the world's most beautiful cities. Following our stay in Cape Town we depart for the bush and what has always been the most popular portion of the trip. The upcoming adventure will take you to the malaria-free Madikwe Game Reserve, where you will spend five luxurious nights at the world renowned Makanyane Safari Lodge. Previous travellers have experienced up close and personal encounters with lions on the doorstep of their suite and elephants grazing in the camp! Don't worry though, you are completely safe. Our guests have often had the honor of seeing the complete "Big Five" - Lion, Leopard, Elephant, Cape Buffalo and Rhino. We have even, on a few occasions, seen the "Magnificent Seven" which also includes African Wild Dog and Cheetah. The setting, local cuisine and attention to detail from the staff are as epic as the game viewing. This is certain to be the trip of a lifetime - so much so that we have had numerous couples come on two trips with us and we have even had a couple return for a third visit. If you would like to experience all that luxurious Africa has to offer without multiple location changes then this is the trip not to miss. From stunning Cape Town to the awe inspiring drama of the African bush - you will do it all while only sleeping in two beds. And we have always felt that the downside to travel is the travel itself. The cost for the trip is $9950 per person for golfers and the dates are January 4-17, which include travel days. We currently have space available for 3 additional couples and are open to customized itineraries for your group to South Africa. Please feel free to visit our website for more details syncexcursions.com.